Time is running out for you to guarantee delivery of our most jam packed mystery box of all time. This December you will be treated to an epic assortment of geeky goodness including items from Star Wars, The Simpsons, and a little nightmarish gift to ensure you have a happyHa-Ha-Haliday. 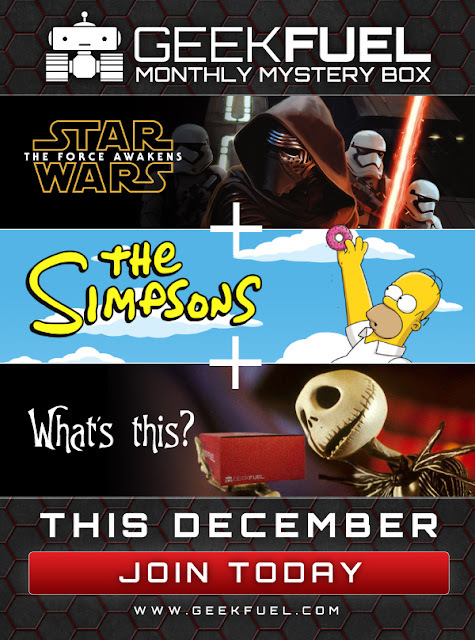 In addition, if you order by December 10th, you will be automatically entered into our Star Wars Movie Ticket Giveaway! Don't delay! These boxes are almost sold out. It’s true; all of it. Geek Fuel is randomly inserting FREE tickets to STAR WARS: THE FORCE AWAKENS in the December mystery box!